OK I know i've been a HORRENDOUS "blogger" for the past 2 months but I have good reason! As you may or may not know I have been interning down in London at Kurt Geiger for the past 6 weeks - and the internet connection where I was staying was an absolute JOKE and I just didn't have the patience for it! So instead of 6 mini weekly round ups like I was planning on posting, you're getting one mammoth post now that I am home and have amazing, fast speed internet! My experience down in London was 134562138284256 times better than I ever thought it would be and the day I had to board my flight back to Scotland was a sad one! It wasn't until coming home and hearing "so, how was it?" by every.single.member of my family and friends that I realised how much fun I actually had! 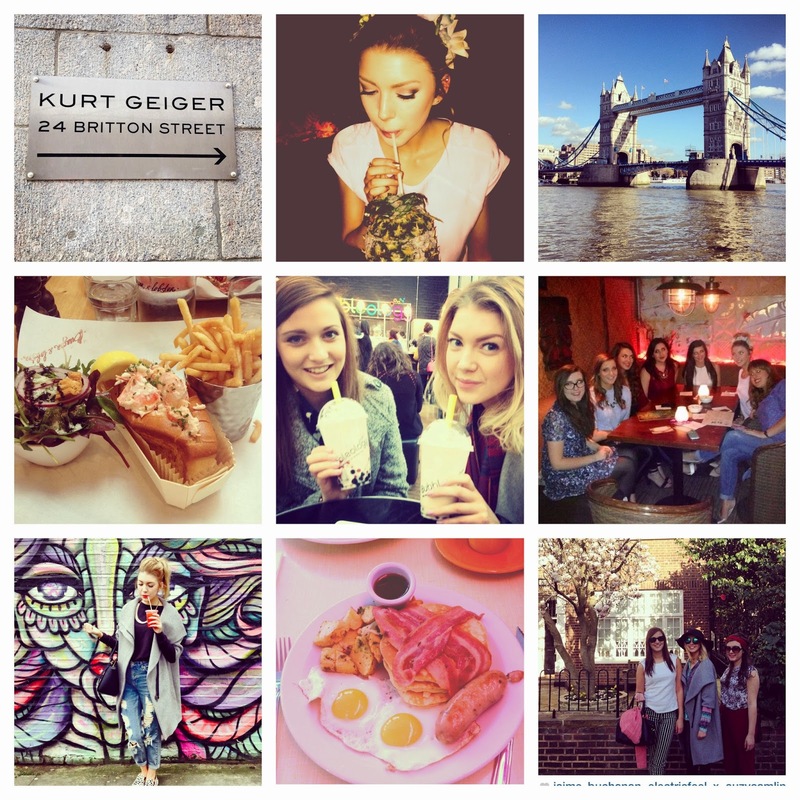 Getting the opportunity to work for Kurt Geiger was incredible, and my job was pretty exciting too! I was in charge of sample requests, meaning if a magazine or stylist needed some KG's, I was your gal! I'm not going to lie, I did have to pinch myself a few times when replying to emails from the likes of Vogue and Elle. I MEAN I WAS TALKING TO VOGUE!!! My favourite week of all HAD to be the week of the Brits. I was never off the phone, talking to everyone and anyone who wanted their celebrity in Kurt Geiger. I spoke to ONE DIRECTIONS stylist and even sent shoes to Beyonce. MADNESS!! Other daily duties involved sorting out all the press coverage we received. The office was so relaxed that I could enjoy a wee cup of tea whilst flicking through pretty much every single glossy magazine available on the market to see if we had been featured. It barely felt like working! Another highlight was sneaking down to the showroom taking a peak at all of next seasons collection. It looks FABULOUS!! I definitely had to restrain myself from trying everything on! Amidst liaising with Vogue, trying on shoes and flicking through magazines, I did actually have to do big girl jobs like competitive analysis and compiling coverage reports, but with music always playing in the office and an endless supply of tea and snacks from the vending machine, it wasn't so bad! Weekends in the capital were perfect! With most of my closest friends all down in London doing placements as well, there was never a dull moment! All of us living in the same building was a bonus because there wasn't one single moment when I felt lonely - which is something I imagined I would in such a big city! We made the most of our days off by spending them together as a group - shopping, exploring and finding AMAZING places to eat! Brick Lane market and Shoreditch were definitely my favourite places. I could spend hours milling around the stalls, eating great food, and finding fun little cocktail bars to relax in in the evenings! I could go on and on about how amazing my experience was and I'd give everything to go back and do it all again! Chrissy, Carley, Asya, Sara, Pascale...if you're reading this, thanks so much again for this incredible opportunity and thank you so much for my leaving gift! I've received so many compliments!! I hope you've all enjoyed reading about my time in London, I'm so sad its over but am so grateful to have done what I've done! I vlogged the whole time I was down there so click the link below to check out week 1's adventures! Did a lot of haulin' in LDN so expect a TON of reviews/outfit posts/other girly ramblings over the next few weeks!